For the 2-day adventure race challenge Endorphin Fix in Hinton, West Virginia, I joined up with Team Berlin Bike. 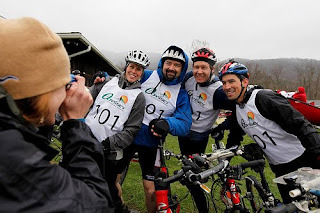 As a relative newbie to adventure racing, I was delighted to be part of a team that was National Champion in 2007.On Thursday, March 25th 2010, I was picked up by my three future teammates, Ben, Ernie, and Rafael, as well as Rafael’s father. The five hours drive to WV helped a lot to get to know each other, and after the drive I was pretty sure it would be a good race. Team Berlin Bike before the race start: Monika, Rafael, Ben, ErnieOn Friday at 9:30am we got the maps and Ernie and Ben mapped out our course. (I don’t know how long each of these sections ended up taking, but you can safely assume each was long) First, we started with a bike prologue followed by a trekking section (12mi), canoe section (3mi), trekking (10mi? ), biking (long), trekking (ok long), biking (nightmare), canoe (relaxing), biking (nightmare again), and canoe (sprint to the finish! ).The bike prologue started out really well for me because I was able to impress my new teammates by falling into the creek, soaking my gloves and pants right from the start. Because 50 hours otherwise would be just way too easy, right? The following trek section almost killed me because Ernie set a speed that I would not even do in a 12 hours race. Also, the weight of my backpack felt like carrying my own weight. The ultimate icing of the cake was the snow, which reminded me of Snowmageddon just two months ago in DC. (Here is a video of us trekking in the snow http://www.youtube.com/watch?v=1b_UuxXyKxY) Lucky me, that I got towed by Rafael for the first trekking part.Nevertheless, after the four hour trek, I knew what to take (a mix of ibuprofen, caffeine pills, electrolytes, more ibuprofen, more caffeine pills and a 5-energy-shot would do the trick). The next leg was paddling. Usually, I am not the biggest fan of any paddling in a race, but this time I was looking forward to an upper body workout and a rest for my legs. We had to take our bikes apart and strap them tightly to the canoe so we wouldn’t have to fish for the parts if the boat capsized. After about two hours of paddling, we realized that our speed must have been 1-2mi/hours, so we exited our boat and resumed our way on foot. The orienteering part began. Up to that time (it was maybe 10pm and 8 hours into the race), our team was very focused on getting from point to point, but I warned them I can be very chatty. On the walk to the orienteering section I looked for a victim who could entertain me…and I found one.Now it was time to find a checkpoint on a hill side, so we bushwhacked into the woods. After half an hour of not finding the checkpoint, we circled back and tried to find it from a different side. The thicket of briars made the walk not so walkable but eventually we found that checkpoint realizing we kind of aimed in the wrong direction.The navigation of the next couple of checkpoints by foot hit the spot. We skipped some optional checkpoints because the ‘energy output: point’ ratio did not convince us to get them. We made our way back to the canoe to cross the river to find the next checkpoints. Mud up to our knees made our progress out of the water slower. The advantage of the mud was that it insulated our shoes (always trying to look for the bright side). Ben nailed the navigation for the next few points, so we made excellent progress on foot. The next checkpoint was supposed to be on a hillside but having arrived at the site, we determined the “hillside” was more like a cliff. We concluded that Ronny, the race director, would never put the checkpoint on a cliff like that and we left without success. Talking later to other teams, we found out that the checkpoint was actually on the cliff. Conclusion: Never underestimate the evilness of the race director. The next checkpoint was on the intersection of two boundaries on a hill side. Not knowing how the boundary was marked, we were looking for something that was out of place in the woods. After an eternity of searching, Ernie finally found a little plate on the other side of a tree (not visible for walkers on the trail) so we could follow the imaginary line of this plate to the checkpoint. The following checkpoint tested my patience because our team decided (not unanimously because I did not participate in the decision making) to find one checkpoint by climbing three times down the same ravine (at least it felt like that) just to climb up that immense ridge again. I was borderline bitchy and then happy when we finally continued without another try. At that point it was daybreak (17 hours into the race) and we had to refill our water. We used the nearby spring to do that. That was the first time I disinfected water during a race and I was surprised it actually tasted better than the chloride stuff from the faucet in my house.We made our way back to the bikes and found ourselves hammering the mud away from the bikes, which froze over the past hours. On the bikes, my favorite part of the race started: biking up the hills. This fun ended when one of my teammates, Rafael, a 230lb muscleman, broke his chain – four times. The break was caused by Rafael’s immense torque and so I volunteered to tow him up some hills to decrease the strain on his chain. Since there was a weight difference of 100 lbs, we had to watch out that we did not come to a dead stop otherwise he would have taken me right back to the bottom of the hill.After an arduous bike section, we arrived in the park for the start of the orienteering section. It was around 11:30am and 21.5 hours into the race. We had four hours to get the checkpoints to beat the cut off time – we did it in three hours. The sun was shining and it was a great day to do some walking through the woods.Back on the bikes, we had to return to the canoes. Our goal was to sit in the canoes before dawn. After a long downhill section (yes, there is downhill too), we had to cross a river. As any of my past teammates can confirm, Monika and river crossings are not a good combination. And of course, I was able to live up to reputation for clumsiness. Before we crossed the river, we took our shoes off so they would not get wet…or at least that was the plan. In my case one of them got wet because I lost my grip and dropped it in. After a panicked “F&@%, I lost my shoe”, Rafael performed a life threatening move in the water to save my shoe. (Ok, maybe it wasn’t that dramatic, but nevertheless, it took some energy to get that damn shoe back. )Up next was a true hill climb. The elevation gain of the entire race was about 32,000 feet or 10km. It took us at least solid two hours to hike up the mountain/hill; it was steep and long. Finally at the peak, we were looking for a remote cemetery (strangely, a lot of checkpoints were on the cemetery) and were coasting the ridge with a beautiful view over West Virginia. At long last and still in sunlight, we made it to the canoes. The first 30 hours had passed. Up to this point in the race, I knew what to expect from myself since I have done several 30 hours races previously. The next 20 hours would become the interesting test.Back in the canoe with our disassembled bikes, we made our way seven miles down the river to a dam. Arriving at the transition area, we had to fight serious mud (see picture) and struggled to get our boats out of the water. After a gear check and two minutes at the bonfire, we hopped back on the bikes and headed to a checkpoint in another park. It was around 10:30pm and we only had 4.5 hours to get the next checkpoint to beat the cut-off time. In high spirits, we started riding with the goal to get there before 4am; however, the demanding hill climbs slowed us down so much that we had to accept we would not make the cut off.With 36 hours into the race, I became increasingly tired and the seemingly endless hills did not help. Still progressing towards the next checkpoint, we saw a lot of teams in their space blanket sleeping on the side of the road. One team apparently managed to sleep in a house. However, my teammates did not seem to be tired at all and so I tried to fight my sleepiness. Eventually, we arrived at the campground, an hour too late for the cut-off. I was so exhausted that I asked my team to sleep for 5 min. Request was granted and I fell to the ground. While I was dreaming of more sleep, my teammates refilled our water bladders and got us ready to go. Because we missed the cutoff, we had to take the same way back. We were still in the race but were not allowed to try for maximum points. Later on, we were told that there was only one team that managed to beat all of the cutoff times. Despite the sleep and better mood, I was not looking forward to climbing the same mountains again. The first hill was so long (maybe an hour) that any benefit from my five minutes of sleep quickly wore off. The sleep monsters crept in and I managed to fall asleep while riding. Cracks in the streets became tree logs and I immensely slowed down, worried that I would hit anything on the street. Of course, my brain was playing games with me. Because I could not keep my eyes open any more, I made a deal with one of my teammates that when we arrived at the top of the hill, I was allowed to sleep for five minutes. The deal was accepted and I sprinted up that mountain hoping that I might gain six minutes out of it. When I woke up, two of my other teammates had apparently been tempted by the comfy grass on the side of the road and were taking a nap as well. I felt better with five minutes rest, but once again the benefit was short lived. After half an hour, I was a wreck again and I repeatedly fell asleep for four seconds at a time not even realizing that I fell asleep. This happened about 20 times. Since some of the sections we were riding were downhill and the side of the road was very steep, my teammates were increasingly worried that I would find an even faster way down the mountain– the steep hillside off the side of the road. Trying to keep me awake, they asked me all kinds of questions. I was just in my own little world, trying to figure out how I can get some sleep. In my head I was plotting to come up with a way to get my teammates to stop so I could sleep. But I never got to put the plan in to action because the sun started to come up and the light helped to keep me awake. What I did not know was the return route had more elevation loss than the way to the campground. So after four hours, we were already back at the canoes. It was around 9am and we only had to make our way back to the finish line. That meant all we had left was two miles of paddling and then to portage the canoe up the hill. Paddling in the canoe would not normally be a big deal….for someone who is awake. However, I fell asleep again. There was a risk I might capsize the boat so Ernie engaged me in a conversation and we safely hit the ground after two hours. The portage up the hill seemed like a piece of cake and we arrived at 11:30am at the finish. It was a great race and it made it even better when we heard that we placed 3rd in the 4-person-coed category and 7th place overall.Racing with Berlin Bike was a great experience. They are a lot of fun. 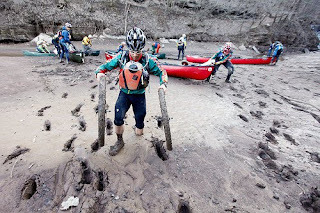 Adventure Racing is all about personality and these guys have great personalities. I also gained experience with sleep deprivation and know now better how to prepare for it. I cant wait for the next race!